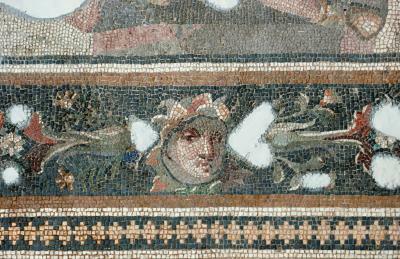 Border of Narcissus and Echo. Harbiye, third century AD, inv. 938. The feet of Echo can just be seen. From the Enc. Britt. : Echo (was) a mountain nymph, or oread. Ovid's Metamorphoses relates that Echo offended the goddess Hera by keeping her in conversation, thus preventing her from spying on one of Zeus' amours. To punish Echo, Hera deprived her of speech, except for the ability to repeat the last words of another. Echo's hopeless love for Narcissus, who fell in love with his own image, made her fade away until all that was left of her was her voice.